I’ve heard they cut wood, too. Thank you for the review and in particular the photos. I have been on the fence between the Stanley, Vertias and the LN for about a month now and your timing couldn’t have been better if I asked you to buy this plane and take pictures of it for me personally. I kinda knew the Stanley would be out of the running but this gives me the comparison I needed to squelch any buyers remorse going with quality over price. +Quick. Am glad my efforts to blog was helpful. Thank you for appreciating. My main goal in taking pictures was to share the latest images of the tool for those trying to decide which brand to buy, despite my very limited time and of course the brand new look before I put it to use. If you look at the link from Amazon, I shared images of my stanley sweetheart LAJ (go to customer images section), wherein the frog was not well machined. I couldn’t return it as I am on the other side of the globe and only do my purchases online. Besides, it’s too costly to ship back and time consuming. It does the job well, but it’s not perfect, doesn’t feel right. So, I look for reasons to buy the veritas LOL. I said to my wife, this is my reward and remembrance for a job well done in my desk job. I tried hours maybe a day filing it but couldn’t make it even. So, I just placed a masking tape on one side to make the blade even. This was due to uneven machining. My name in Amazon is Jasper D.
Jack, I noticed in your pics you also have the bevel down Stanley Sweetheart. Curious what your impressions of it are? +OSU55. The Stanley sweetheart smoother is well built except the lever adjuster which is a little loose. I put teflon tape to make it snug. I haven’t used it that much as I get the level of smoothness I want from the Stanley SW LAJ. If you want to see more reviews of the Stanley Sw 4 1/2 there are a lot of good reviews in Amazon. Would you share why you went with the Veritas instead of the Lie Nielsen? I am thinking one of those two may be my next plane purchase. How is the tote on the Veritas. I haven’t looked in while, but Veritas used to have these flat sided totes that were not as fully formed as LN. This was always a sticking point for me, though it doesn’t matter to a lot of people. From your pictures I can’t see the tote real well. I’m just wondering if Veritas has addressed the totes. I hope so because the machining and finish looks superb on your Veritas, and I’m tempted. +Brian. First off, thanks for asking that question. You made me recall the feeling and dilemma I had day in day out when I was deciding, plus an opportunity for me to write it down. From the start of my research, my first choice was the LN, primarily because of the overall built and quality of the tool, plus the outstanding reputation known by woodworkers on the internet. But, if you have watched Paul Seller’s videos, his approach to woodworking is so practical and inexpensive. So, I settled on the Stanley sweetheart LAJ, only to find out a small flaw on the plane bed or frog, although it does the job as it was intended, I still need to put a small masking tape to make the bed even. Then, goes the saying, you get what you pay for. LOL. You can see my comments in Amazon for the Stanley sweetheart LAJ. It wasn’t perfect and it doesn’t feel good. My craving and passion for accuracy and precision, didn’t just want to lose the joy and opportunity to use a tool made from high quality. Still, when deciding, I needed to convinced myself harder and it needs to be on a sound judgement. 2. LV plane sole was wider and longer compared to LN. I know, it will take a while before I can buy a jointer so I prefer the longer Jack plane. In fact, am even thinking of just building the 18th century jointer plane using one of the extra blades I have on the Veritas LAJ. 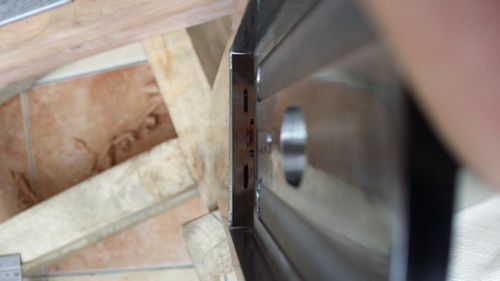 I just haven’t seen anyone do a wooden jointer in a low angle bevel up blade. Plus, time constraints. 5. Low center of gravity. Approximately 5” long, the toe is one third the length of the sole. 7. Also, by not having the brass adjustment lever on the tote handle, I don’t know by LN coz I haven’t use one but on the Stanley SW, on longer usage, I notice a feel small discomfort as my hand rest on the brass adjustment lever. 8. And, not having to make nor buy a hotdog when using for shooting end grain. The lever cap design makes this possible along with the shallow machining on both sides. 9. Not to forget the good reviews of Lee Valley customer service. Ah. Just knowing how receptive they are means a lot. In fact, when I placed my purchase, I took time to email LV and explicitly told them, to double check my items as I can’t afford to return a defective item, considering my location and amount of time to ship. For the record, it took me two months before I was able to get hold of the item. Well, I chose to ship via sea, instead of air as it is cheaper. I splurged my spending on the item and comprised by exercising my EQ when I can. LOL. In almost all the reviews and videos I have seen, both the LV and LN LAJ are the same in quality and performance. The 10 items I listed are just pluses in a way but have persuaded me to make my purchase on the LV. If money was not a concern, I would have buy both, maybe someday but I think it would make more sense if I buy something that I really don’t have yet. Like, the LN No. 610 LAJ Rabbet, or the LN Rabbet block plane. Overall, the reviews would always tell, it a personal preference, or if you have an opportunity to try them personally, by any means do, which is not an option for me since am on the other side of the globe and an online purchaser. +mcase. The handle or tote still has the flat sides. i immediately noticed that as compared to my Stanley SW. I prefer the Stanley handle and thought the LN might even be better. Downside of purchasing online but I can live with it. Maybe someday, I will custom build my own handle. Glad you like your purchase. I am a huge fan of both brands. If you like the LV LAJ then you would like their rabbeting block. Set screws on both sides of the iron and one in the mouth. I chose it over the LN. I like LVs spokeshaves and marking gear as well. For bench planes and chisels I go with LN personally. I have a 4-1/2 w a 55deg frog for wild grain or whatever and it is one well built SOB. And the chisels are top notch. I’ve sold off almost all my Stanley stuff to finance it and it has been worth every freakin penny. Can’t really go wrong with either. So, I settled on the Stanley sweetheart LAJ, only to find out a small flaw on the plane bed or frog, although it does the job as it was intended, I still need to put a small masking tape to make the bed even. I would think a little work with a file would fix the flaw. +Combo Prof. I thought so too. I tried filing for 4 hours but when my hands were sore I gave up. I think I removed some already. See attached image. Sorry image can’t be rotated when attached.